Remember the back row of the pictures? You had to be there early to get your seats, though! Despite the rise in popularity of the telly the cinema remained the number one place for a night out. Films of the decade included the smash hit On the Waterfront with method acting to the fore from Marlon Brando. 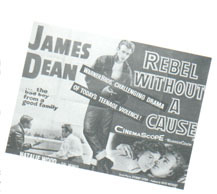 Then there was Rebel Without a Cause - "Warner Bros' challenging drama of today's teenage violence" and the movie that made James Dean a star. Dean played the bad boy from a good family according to the cinema posters of the time. The movie moguls also saw the change in our lifestyles as an opportunity for new and ever more daring films. Rock 'n' roll, seen by many Fifties adults as corrupt and a damaging influence on the young was sensationalised. It did not take long for youngsters to act out what they had seen on screen which was largely down to the imagination of the scriptwriters. Fifties movie makers have a lot to answer for. 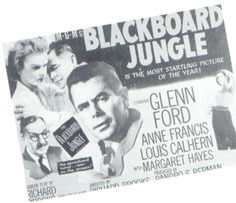 Blackboard Jungle was billed as the "most startling film of the year". Running Wild came up with the "stark savage truth about the juke box jungle" and just to encourage the teenage gangs it purported to be about included Bill Haley singing Razzle Dazzle. Jayne Mansfield (who can forget her?) 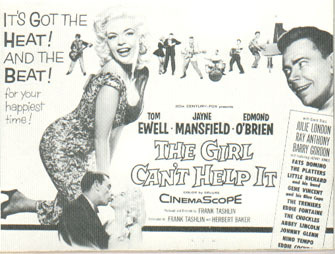 starred in The Girl Can't Help It, a sugary movie that showed the lighter side of Fifties life. One 1956 reviewer was intrigued by Little Richard who featured in the movie alonside stars such as Fats Domino and The Platters. He said of the rock star: "He's a diminutive South Sea Islander who plays the piano standing up." Richard's then army of fans may have seen it differently. Story lines in these movies were almost non-existent, mainly being churned out to promote rock 'n'roll and its new young stars.